Many women with thinning hair want to add some height, volume or fullness to their existing hair without wearing a full wig. Hairpieces and hair extensions can do just that. There are many different types of hair pieces, hair extensions and toppers that are popular for women with thinning hair. They often have a small base that will cover a targeted area where hair is sparse. Hairpieces and hair extensions are not only great for women with some hair loss, but are also loved by women who just want to add some length or pump up the volume for a night on the town! What are Hair Pieces and Hair Extensions? Unlike full wigs, hair pieces and hair extensions do not cover the entire head. They are clipped in to existing hair to add volume, fullness, or cover baldness in specific areas. Hair pieces can often have a partial base, meaning that they cover a significant portion of the head, but are not considered a full wig. Hair extensions usually include small lengths of hair that are added into and concealed by existing hair. They provide a certain amount of volume or length. Clip in or detachable bangs also fall into this category. Bangs can be added or removed, offering style choices that are commitment free and so versatile. Accessory hair opens the door to many new styling options including buns, braided headbands and more. Hairpieces for women have been used by celebrities for decades to fill out their locks for luscious appeal. And who can blame them? Full, bouncy add-ins are a fun way to enhance your natural flair, sort of like mascara for your hair. Whether or not you’re experiencing hair loss, at Headcovers we offer options for all, from risk-free clip-in bangs to Rapunzel-esque ponytails and sleek, enhancing toppers. Which Type of Coverage Should You Choose? 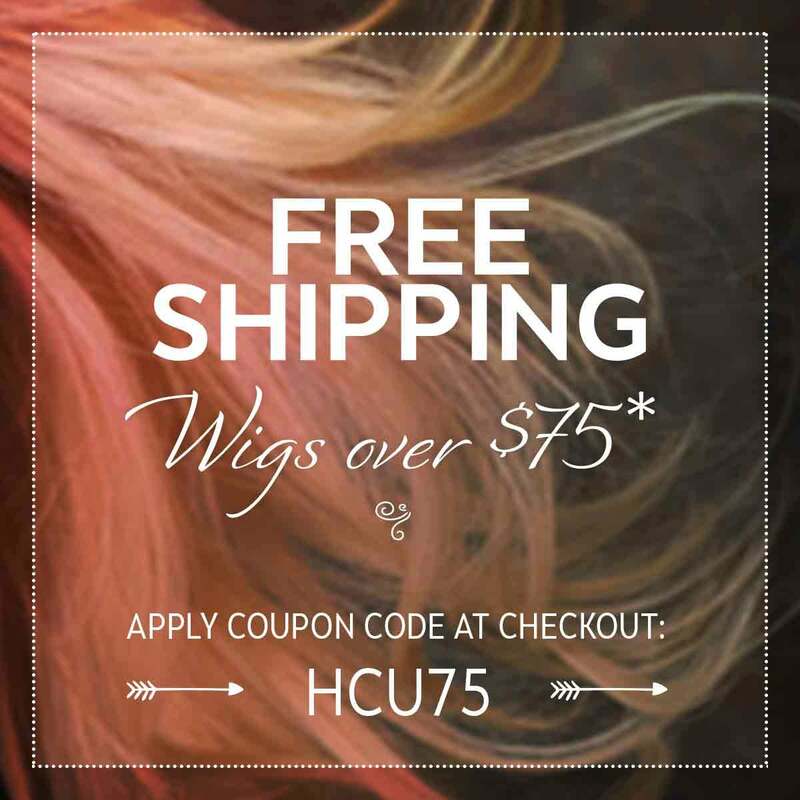 We understand that it can feel overwhelming to survey our variety of hairpieces for women if you’re not exactly sure what you’re looking for. The key is to first determine which type of coverage you need. For a comprehensive guide to figuring out which topper will serve you best, see our Hair Toppers and Wiglets resource. For more targeted help, our Hair Topper Style Chart is almost like a personal shopper, recommending specific products based on your coverage needs. Or, use our “Select Head Coverage” filter on the left side of the page to narrow your viewing options based on which part of your head is lacking in volume. We’re also here at 1-800-264-HATS (4287) to provide guidance and answer any questions you may have. Often when people consider hairpieces for women, they think of hair extensions. These are a classic and beloved way to pull off hairstyles with a little more oomph. Available in a variety of lengths, the clip-on hairpieces are attached using pressure-sensitive clips to seamlessly achieve fuller hair. However, at Headcovers, extensions are just the beginning. Check out our selection of bangs, both clip-in and Velcro attachable, which frame the face with a flattering fringe. Fake bangs can be attached to a hat, scarf, or turban to easily transition between outfits. We also offer accessory hair pieces such as our popular braided headband from Christie Brinkley or our elegant Do Wrap Hairpiece. Accessory hairpieces are a simple, low-maintenance way to add some spice to your everyday look. If you’re hoping for bald patch help, our toppers and wiglets can come to the rescue, offering coverage solutions without the all-consuming effect of a wig. What Material Should My Hairpiece be Made of? The reality is that each hairpiece we offer has been selected because it looks great, no matter what it’s made of. However, just like purchasing a new sweater, the material determines the price, care instructions, and lifespan of the hairpiece. At Headcovers, we offer four main material types of clip on hairpieces: human hair, Remy human hair, synthetic hair, and heat friendly synthetic hair. While synthetic is the easiest to take care of, real hair offers coverage that is virtually indistinguishable to the wearer as well as the observer. Take the time to browse our Synthetic Hair vs. Human Hair guide to figure out which material will best fit your lifestyle, budget, and needs. At Headcovers, we understand that confidence is an important part of mental and emotional health. If your body is experiencing changes like hair loss or thinning, the effect can be confusing and discouraging. While we believe in natural beauty at every stage, a hairpiece can ease the stress of hair loss, allowing you to live freely and, most importantly, normally. We love that clip-on hairpieces offer convenience and the flexibility to change-up your look on a day-to-day basis.